Army of the Ukrainian National Republic. 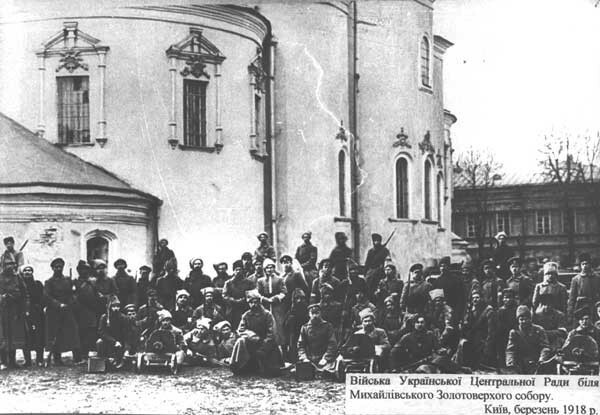 The armed forces of Ukraine during the struggle for independence (1917–20). Unlike the Ukrainian Galician Army, the regular armed forces of the Western Ukrainian National Republic, the Army of the Ukrainian National Republic was never a regular, well-structured organization, but was made up of various armed volunteer units. The history of the UNR Army can be divided into three main phases: the periods of the Central Rada, the Hetman government, and the Directory of the Ukrainian National Republic, although the formation of its units in all phases was to a large degree spontaneous and chaotic. During the Central Rada period the UNR Army was formed in three ways: (1) by spontaneous detachment of Ukrainian units from the Russian army, forming, on the western front, the Haidamaka Cavalry Regiment; in Moscow, three Shevchenko regiments; in Simferopol and Chernihiv, the Doroshenko regiments; in Kyiv, the Polubotok Regiment, the Khmelnytsky Regiment (Bohdanivtsi), and other smaller units; (2) through Ukrainianization of Russian army units (at first without, but later with, the consent of the Russian army command); (3) through the reorganization of former army units (eg, the Sich Riflemen company was formed out of Austrian prisoners of war in Russia) or the creation of new units out of various army personnel (eg, the Bluecoats were formed out of Ukrainian prisoners of war in German camps and the Graycoats were formed out of Ukrainian prisoners of war in Austrian POW camps). The formation of Ukrainian units in the Russian army was part of the process of general disintegration of the multinational Russian army along national lines that had begun at the front and in the rear immediately after the February Revolution of 1917. Soviets of soldiers' deputies were elected by separate units. In units with a significant number of Ukrainian soldiers, separate Ukrainian soldiers' soviets were formed in parallel with the general soviets (in the rear they were called also soldiers' clubs, assemblies, and committees). 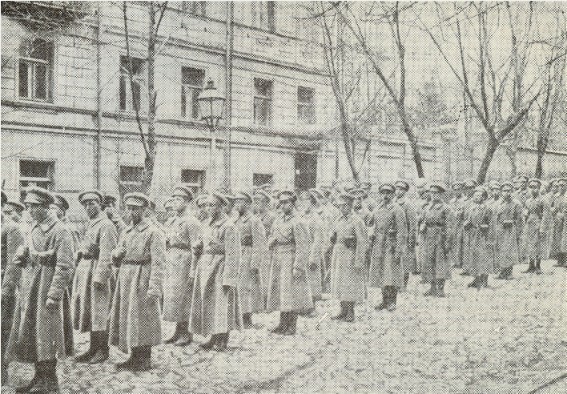 Apart from the spontaneous national awakening, an important role in the formation of Ukrainian units was played by the Ukrainian Military Club (formed in Kyiv on 22 February on the initiative of Lt Mykola Mikhnovsky), which formed the Ukrainian Military Organizing Committee, whose task was to organize Ukrainian volunteer units. 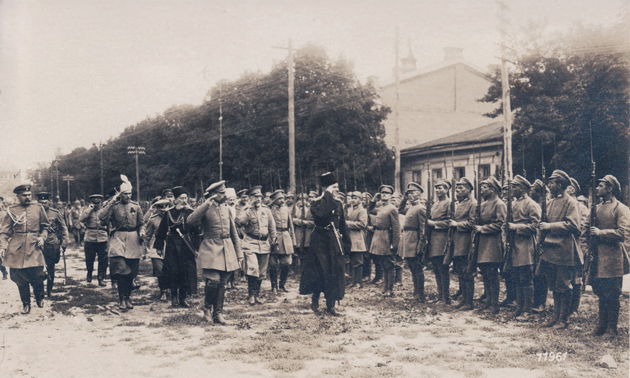 The appeals of the committee were very successful and stimulated the first manifestation of Ukrainian military strength during the All-Ukrainian military congresses in Kyiv (the first on 18–21 May 1917, the second on 18–23 June, the third on 2–12 November), which supported the Central Rada unconditionally, called for the separation of Ukrainian units from the Russian army and elected the first military leadership—the Ukrainian Military Committee. 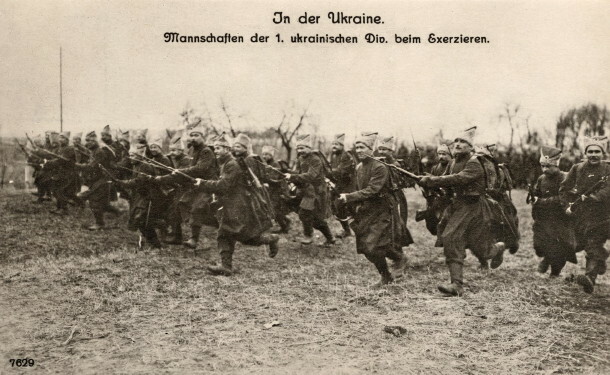 Instances of spontaneous Ukrainianization on the front became widespread (on the northern front, the 21st Corps; on the Romanian front, the 10th and 11th corps; on the western front, part of the 9th Corps). In units that were nationally mixed, the Ukrainian soldiers formed their own subunits, in which both discipline and fighting ability were superior and resistance to the Bolshevik appeals for demobilization was stronger than in other subunits. Because of this and the demands of the representatives of the organizing committee, the Russian commander in chief, Gen A. Brusilov, agreed to the official Ukrainianization of some units: the two-division 34th Russian Corps under the command of Gen Pavlo Skoropadsky (renamed the 1st Ukrainian) and the 6th Russian Corps (renamed the 2nd Sich Zaporozhian Corps) under the command of Gen Mandryka. Of 4 million Ukrainians in the Russian army in 1917, only 1.5 million were Ukrainianized, and the majority of these declared themselves neutral when it came to fighting the Bolsheviks or demobilized under the influence of Bolshevik agitation. The Central Rada itself had no clear plans concerning military organization and did not recognize the need for a standing army based on compulsory military service. Instead, the concept of Free Cossacks, a volunteer, territorial, national militia, won out and was ratified by the Rada on 13 November 1917. As a result, on the eve of the Bolshevik invasion, the Central Rada announced the demobilization of the regular army (16 January 1918). Instead of building a standing army the government began recruitment for the national militia, for which uniforms and insignia were already designed. The Ukrainian-Bolshevik war (see Ukrainian-Soviet War, 1917–21) convinced the Central Rada that Ukraine needed a regular standing army. A recruitment plan was worked out for an army that was to be made up of eight infantry corps and four cavalry divisions. Before these plans could be realized the Central Rada was overthrown by the Germans and replaced by the Hetman government. Before the downfall of the Central Rada, the UNR Army consisted of the Zaporozhian Corps (four infantry regiments, one cavalry regiment, and two light-artillery detachments), the Sich Riflemen Regiment, the Bluecoats, the Graycoats (in the process of formation), plus an indeterminate number of Free Cossacks, for a total of approximately 15,000 soldiers. After the First All-Ukrainian Military Congress, the command of the UNR Army was taken over by the Ukrainian General Military Committee, headed by Symon Petliura. After the proclamation of the Ukrainian National Republic on 20 November 1917, a General Secretariat of Military Affairs was formed (general secretary, Petliura; chief of the general staff, Oleksander Hrekov). After the proclamation of the independence of Ukraine on 22 January 1918 the Ministry of Military Affairs of the Ukrainian National Republic was formed (Mykola Porsh, A. Nemolovsky, and Col Oleksander Zhukovsky were ministers) and, under its auspices, the Military General Staff was created (headed by Gen Hrekov, Gen B. Bobrovsky, and Col Oleksander Slyvynsky). At first the general staff had several departments (organization, liaison, supplies, training, and artillery), whose number was reduced to only two—the organizational department and the quartermaster's department—after a reorganization by Col Slyvynsky. During the period of the Central Rada the UNR Army was in a constant state of organization. Units that were formed at the front continued to serve there until the armistice, leaving the defense of Kyiv and the government mainly to the units of the Kyiv garrison (the Haidamaka Battalion of Slobidska Ukraine, commanded by Otaman Symon Petliura, the Galician Battalion of the Sich Riflemen, 16 small battalions of Free Cossacks under Mykhailo Kovenko, and the auxiliary student battalion of the Sich Riflemen under Capt Ahapii Honcharenko, which was routed in the Battle of Kruty). Such a weak force could not hold Kyiv, and the Bolsheviks occupied the city on 8 February 1918. Only at the end of the month, after the Peace Treaty of Brest-Litovsk and the signing of the armistice with the Central Powers, were the Ukrainian forces, under Gen K. Prisovsky and Otaman Petliura and with the help of the Austro-Hungarian and German armies, able to repel the Bolsheviks. In addition to the battles for Kyiv, the Ukrainian forces (the Zaporozhian Corps under Gen Oleksander Natiiv and the detachments of Otaman Petro Bolbochan and Otaman Volodymyr Sikevych) occupied the Crimea and the Don region. But the Germans forced the Ukrainian army to leave the Crimea because it was not part of the Ukrainian National Republic and, on the eve of the establishment of the Hetman government, reduced the UNR Army to the Zaporozhian Corps after disarming the Bluecoats and the Sich Riflemen Regiment. The Hetman government. Although the government and even the name of the country were changed (to the Ukrainian State), plans for establishing a regular army continued to be pursued. On 24 July 1918 the Council of Ministers passed a law establishing compulsory military service and ratified plans for the organization of the army (formerly proposed under the Central Rada), military courts, and medical services and supplies. In peacetime the army was to consist of 310,000 military personnel in eight territorial corps, with a budget of 1,254 million karbovantsi annually. A uniform was not established for the Ukrainian army, but military ranks and insignia were to be based on the German model, and the trident was ratified as the insignia for the cap (it remained so after the fall of the hetman). On 16 October 1918 by proclamation of the hetman, the Cossack organizational system, based on territorial units (several regiments in each unit) and otaman commanders under the hetman, was revived. The Cossacks were to be governed by the Great Cossack Council (with 32 members, some of whom were elected and others appointed). Although the otaman commanders were appointed, the Cossack system could not be put into effect before the November uprising against the hetman. 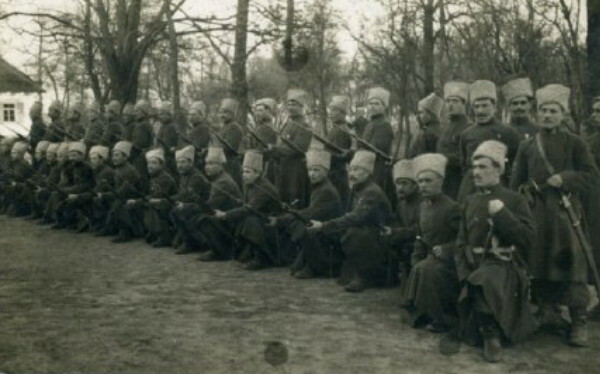 Apart from the units that remained from the period of the Central Rada (the Zaporozhian Corps, renamed the Zaporozhian Division; the Zaporozhian and the Black Sea garrisons), some units were formed during the Hetman government: the Serdiuk Guard Division (in July 1918, 5,000 men) (see Serdiuk guard divisions), the Graycoats (begun in Austria under the Central Rada), the Sich Riflemen unit (revived as a separate detachment of the Sich Riflemen at the end of August 1918). In the autumn of 1918 commissioned and non-commissioned officer corps and cavalry divisions were formed. 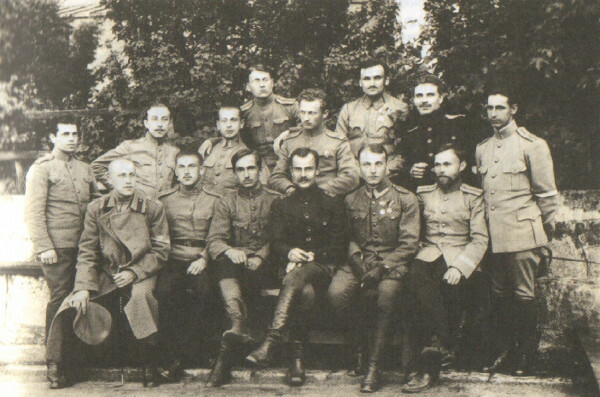 In October 1918 the Special Corps was formed of Russian officers, and in the larger cities Russian volunteer-officer companies were formed as part of the Ukrainian army. The armed forces were acquiring a Russian character through the ‘National Guard’ (Derzhavna Varta), whose composition made it a continuation of the tsarist police, and the district special companies, which had been used for punitive expeditions. In November 1918 the Army of the Ukrainian State numbered 60,000 and was under the authority of the War Ministry. Gen Aleksandr Rogoza, a Russian, was appointed minister by the hetman; Col Kakurin was appointed chief of the general staff; Gen Drozdovsky and Gen Prokhorovych were appointed chief quartermasters. Although Ukraine was not at war between July and October 1918, the Hetman government took an active interest in the army. However, the Army of the Ukrainian State did not develop beyond the organizational phase, although it did receive a good organizational foundation. Its development was hindered by the officers who were often indifferent or hostile to the Ukrainian movement (to become an officer one had to have a record of active service before the war and many who did were Russians) and by the German high command, which feared a sizable Ukrainian armed force. The situation improved slightly as a result of the personal visit of the hetman to the kaiser Wilhelm II in Berlin, but the continuing revolts of the populace against the oppression of the Hetman government and the arbitrariness of the Russian Whites, tolerated by the hetman, forced him to appoint as chief commander of the armed forces Gen Fedor Keller, who, on 11 November, abrogated all Ukrainian army regulations and replaced them with Russian ones. Only the November uprising against the hetman, organized by the Ukrainian National Union (which later designated the Directory of the Ukrainian National Republic) saved the UNR Army from Russification and the Ukrainian state from absorption into the Russian anti-Bolshevik movement. The period of the Directory. Although many independent insurgent units (eg, the Dnipro Division, which fell apart after the occupation of Kyiv, and the Black Sea Division, which was crushed in battle by the Bolsheviks) took part in the uprising against Hetman Pavlo Skoropadsky, the main part of the UNR Army was at first made up of those units that crossed from the hetman's side to the Directory: the Zaporozhian Division, the Graycoats, and the Sich Riflemen Regiment, which expanded into a two-division corps incorporating the Serdiuk guard divisions and other units and was renamed the Siege Corps of Sich Riflemen. Later, on the orders of the Directory, other units were formed: the Volhynia Division (composed of the hetman's Nalyvaiko Regiment, the Galician Regiment, the Czech-Ukrainian Regiment, and others) and the Podilia Division (made up of various revolutionary groups that were active in Podilia—the Karmeliuk, Zalizniak, Blackhoods [Chornoslychnyky] and other regiments). 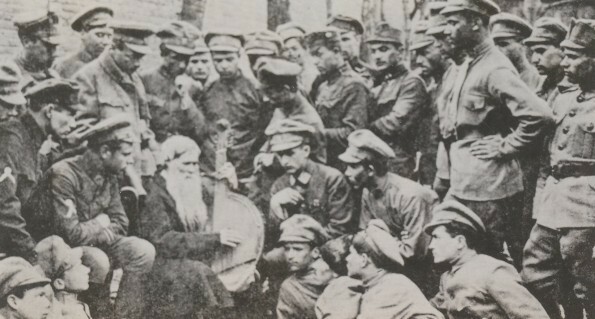 In December 1918 the General Council (Heneralna Bulava) of the Ministry of War organized the UNR Army into four groups, in accordance with the demands of the front: Left Bank (under Otaman Petro Bolbochan, in charge of the Bolshevik front), North Right Bank (under Otaman Volodymyr Oskilko, in charge of the Bolshevik-Polish front), Southern (under Gen Oleksander Hrekov, in charge of the front against the Entente), and Dniester (on the Romanian front). In February 1919 the Southern and Dniester groups were disbanded, and their units transferred to the Bolshevik front. Apart from the regular units there were also partisan detachments, commanded by politically inexperienced officers lacking any national consciousness. They willingly rose up against Pavlo Skoropadsky, but in battles with the Bolsheviks succumbed to their propaganda, declared themselves neutral, and often, in critical moments, would cross over to the Bolshevik side (Nestor Makhno, Nykyfor Hryhoriv, and Danylo Zeleny; see Partisan movement in Ukraine, 1918–22). 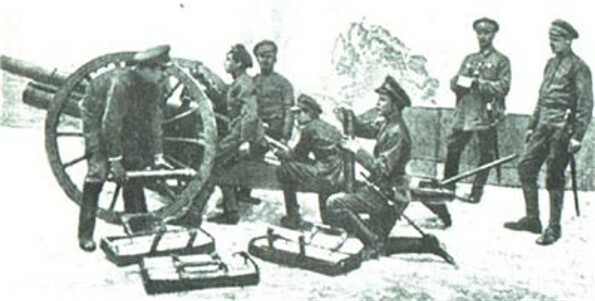 After the retreat to the Right Bank (spring 1919), the UNR Army was again reorganized: small units were amalgamated into 11 divisions (each consisting of three infantry, one artillery, and one cavalry regiment) and divided into five independent detachments: the Sich Riflemen (three divisions) under Col Yevhen Konovalets, the Zaporozhian Group (three divisions) under Col Volodymyr Salsky, the Volhynia Group (two divisions) under Col Vsevolod Petriv, a division under Col Oleksander Udovychenko, and two divisions under Otaman Vasyl Tiutiunnyk. In mid-July 1919 the Ukrainian Galician Army crossed the Zbruch River and, although it continued to exist as a separate unit under its own command, co-ordinated its actions with the UNR Army under a common operational command—the supreme otaman's staff. At this time the armed forces of the Ukrainian state consisted of three Galician corps (50,000 men) and five formations of the UNR Army (30,000 men). The total fighting strength of the united armies, together with the partisan detachments (Nestor Makhno in the Katerynoslav region, Anhel in the Chernihiv region, Danylo Zeleny in the south, Ya. Shepel in the Lityn region, Nykyfor Hryhoriv in the Kherson region, and others), was about 100,000 personnel (including 35,000 combat troops), 335 cannons, 1,100 machine guns, two air regiments, and armored trains and motor vehicles. UNR Army command. With the establishment of the Directory of the Ukrainian National Republic, military affairs were taken over by Symon Petliura. He was designated supreme otaman (commander in chief) and under his authority were put the Ministry of War (headed, in turn, by the generals Oleksander Hrekov, Vsevolod Petriv, and Volodymyr Salsky) and the acting otaman (Gen Oleksander Osetsky), who directed army operations and the general staff. The general staff was again reorganized into a two-quartermaster system (an operational section under Gen Drozdovsky and an organizational section under Gen Kakurin), with appropriate departments (operations, intelligence, foreign relations, etc). After the retreat from Kyiv the command of the UNR Army was assumed by the staff of the acting army, which consulted with Petliura only on crucial decisions. The staff of the acting army was headed by Otaman Andrii Melnyk, with Vasyl Tiutiunnyk as second in command. 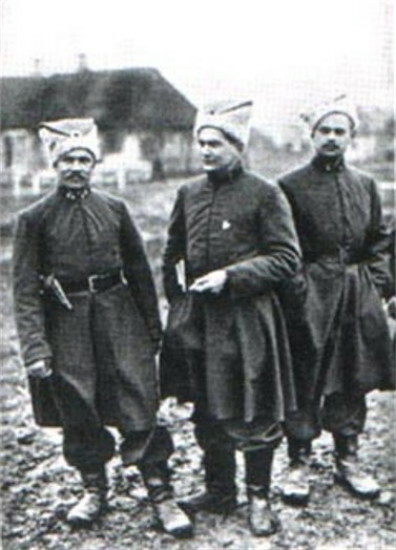 Gen Volodymyr Sinkler was chief quartermaster, Col Mykola Kapustiansky was operations chief, and Col Mykola Chebotariv was chief of intelligence. After the operational union of the two armies (Ukrainian Galician Army and UNR Army), a supreme otaman's staff was created. It was made up of personnel from both armies (Gen Mykola Yunakiv was chief of staff, Gen Viktor Kurmanovych was chief quartermaster, Lt Col K. Dolezhal was in charge of operations, and Lt Col Hrytsiv was in charge of intelligence). From the First Winter Campaign to the end of the war for independence, the command of the UNR Army consisted of Gen Mykhailo Omelianovych-Pavlenko, commander in chief; Col Petro Lypko, chief of staff; and Gen Viktor Kushch, chief quartermaster. The Ministry of War was headed by Gen Oleksa Halkyn and then Col V. Salsky. The restored general staff was headed by Gen V. Sinkler, and Gen M. Yunakiv was head of the Supreme Military Council of the Ukrainian National Republic. From December 1918 to the fall of the Directory of the Ukrainian National Republic warfare continued uninterruptedly. The front shifted, and at the same time units were re-formed and renamed. After a difficult retreat in the fall of 1919, the UNR Army found itself near Chortoryia in Volhynia, surrounded by Polish troops, by the Bolsheviks, and by Anton Denikin's army, without any possibility of maintaining a regular front. It was forced to resort to guerrilla warfare, and on 6 December 1919 the UNR Army set out on the First Winter Campaign. In this campaign the following divisions took part: Zaporozhian Division, Volhynian Division, Kyiv Division (Peasant), and some detachments of the Sich Riflemen. In May 1920, 2,680 men returned from the campaign, and they took part in the continuing Ukrainian-Soviet War. In January 1920 the Sixth Sich Division of the Army of the UNR, under Col Marko Bezruchko, and the revived Third Iron Rifle Division of the Army of the UNR, under Col Oleksander Udovychenko, were formed from Ukrainian prisoners of war interned in Poland. They were attached to the 3rd and 6th Polish armies, remaining there through the Polish-Ukrainian campaign against the Bolsheviks. At the beginning of the joint Polish-Ukrainian effort, the UNR Army was composed of the following divisions: the Zaporozhian Division, Volhynian Division, Third Iron Rifle Division, Kyiv Division, Kherson Division, and Sich Division (each made up of three infantry brigades with artillery, one cavalry regiment, and one technical regiment); there was also a separate cavalry division (see Separate Cavalry Division of the Army of the UNR). At the end of the Polish-Ukrainian war in October 1920, the UNR Army had 23,000 men. 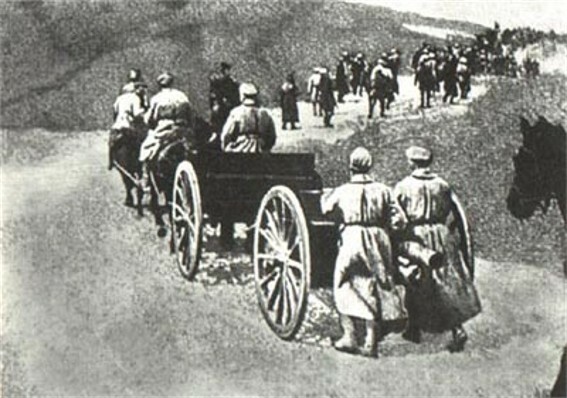 After the Polish-Bolshevik armistice the staff of the UNR Army prepared an anti-Bolshevik offensive, but the Red Army began its own offensive, and after intense battles (11–12 November 1920) the Ukrainian army retreated westward. On 21 November the UNR Army crossed the Zbruch River and was interned by the Polish authorities. The war in Ukraine continued, fought by guerrilla detachments under the Revolutionary staff, headed by Gen Yurii Tiutiunnyk. At the beginning of November 1921 the Revolutionary staff ordered a partisan raid on the Right Bank (the so-called Second Winter Campaign) to be carried out by two groups—a Podilian unit and a Volhynian unit, made up of 1,500 volunteers from among the interned soldiers of the UNR Army. The Bolsheviks routed both groups. The Volhynian unit was surrounded and defeated near Bazar; 359 soldiers were executed (23 November 1921). After a lengthy and difficult confinement in internment camps in Poland (Wadowice, Piotrków Trybunalski, Tuchola, Aleksandrów Kujawski, Łańcut, Strzałków, Kalisz, Szczepiórno), the interned soldiers of the UNR Army were granted the status of émigrés. The staff of the UNR Army continued to exist as an institution subordinate to the Government-in-exile of the Ukrainian National Republic. The military traditions of the UNR Army were preserved by various Ukrainian veterans' organizations, the most active of which was the Society of Former Combatants of the Ukrainian Republican Democratic Army in France (est 1927). General characteristics of the UNR Army. Having been formed basically by Russian army personnel, the UNR Army followed Russian organizational and tactical models. Because of the frequent changes of the front, regimes, and military commands, because of the anarchy created by guerrilla detachments, and because of German and Austrian opposition, the UNR Army was never able to complete its organization through conscription or general mobilization and hence remained essentially an army of volunteers. The army had no durable home front and hence no permanent base from which to draw human and material resources. Organization, training, uniforms, arms—all the elements of a normal army—were in the process of organization and subject to the vicissitudes of the Ukrainian struggle for independence (1917–1920). A referral to this page is found in 136 entries.